A few weeks ago I joined a knitting group that meets at the lovely little downtown bookshop, Nomad Bookhouse. They meet on the 3rd Monday of the month -- I figured I could handle joining a group that meets once a month. The group is called Sip 'N' Knit. I found out about the group in Nomad's new newsletter. The idea was to work with the book, Knitting for Peace. I didn't own the book (have purchased it since then), so I went online and read reviews. I wanted to be prepared to start knitting a project at the first meeting, so after quite a bit of research, I chose to knit for Afghans for Afghans. I love the idea of sending something warm to an Afghan child. And, since they require that you work in a natural animal-based fiber, I knew this was my project. 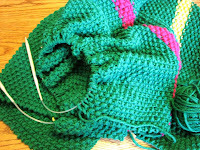 I want to follow the instructions explicitly so that my knitted piece will fit into their guidelines. I d ecided on an afghan/blanket for a baby or child. They require them to be a minimum of 30" x 40". Mine will end up being more like 40" x 50". Afghans like color, so I'm making it quite colorful. And they suggest using the color green -- it's good luck for Muslims. So the blanket is mostly green with occasional stripes of bright color.